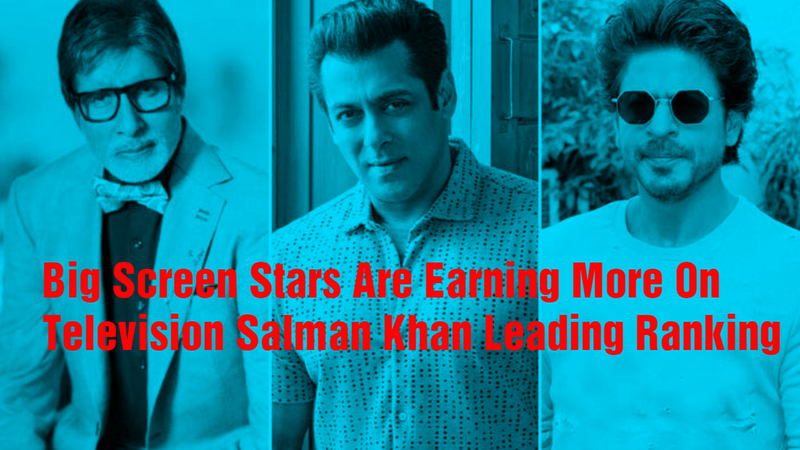 Big Screen Stars Are Earning More On Television Salman Khan Leading In Ranking: Big screen stars are earning more on television than movies. Examples are stars like Amitabh Bachchan, Salman Khan, and Shahrukh Khan. Salman only 'Race-3' came in 2018, for which he had earned around 60 crores of rupees. While this year, they are earning about Rs 430 crore from just two TV shows. Which is almost seven times more than his film's earnings. Trade analyst Atul Mohan says that the presence of big stars has increased due to money on TV. In addition to hosting the show, channels are also using in brand and channel promotions. Some stars are also supporting the channel in the creative field. That's why money is also increasing. Atul says that the show sponsor on TV is also much more. Whereas in the movies only stars get money for shooting and promotion. Trade analyst Komal Nahta says that the content is the king. That is why big stars have no problem in doing good and interesting concept shows. They get big exposure on the TV. Also, the channels do not hesitate to bet on them. In the past, Salman himself has admitted that TV stars are earning more money than films. He had said that now TV actors have more money than many movie stars. They have 3-4 flats in Mumbai, they are living a luxurious life. Salman has joined the TV show Big Boss for 9 years. Salman was associated with Bigg Boss in the fourth season of the show. Then they would get Rs 2.5 crore Used to charge per episode. This time around Rs 14 crore of every episode Is taking. This season will be around 12 weeks. That's about Rs 340 crore They will earn from one season. Similarly, for this year 'Dus Ka Dum' season 2, they have 90 crores for 26 episodes. They take about 60 crores for a film. Amitabh Bachchan is hosting the tenth season of 'Kaun Banega Crorepati'. Each episode has three crore rupees. Last year, he used to take two crore rupees for every episode. This time Amitabh will do 60 episodes for KBC three months, for which he will get Rs 180 crore. When Amitabh plays a lead role in a movie, he charges about 10 crores, while the cameo rolls do it for two-three crores. Shahrukh Khan may also earn more than TV shows this year. He is going to return to his chat show 'Ted Talk India Nayi Soch' on TV. For a series of 16 episodes, they will get around Rs 45 crore. For the last season, Shahrukh got Rs 30 crore. Shahrukh now charges Rs 30-35 crore for a film. However, they also share their profits.